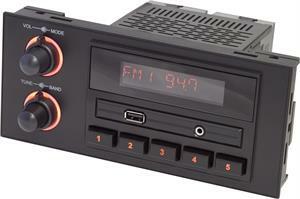 The RetroSound Newport is a direct-fit replacement radio for your 1985-87 Pontiac Grand Am & Prix. The Newport looks and fits like the original factory radio, but boasts the most modern technological features. An Apple Made-For-iPod interface is built in, as is Bluetooth connectivity for hands-free phone calls and wireless audio streaming. The Newport features a dual-color (amber or green) color display and back-lit buttons. Two USB ports for iPod/iPhone or flash drive (one on the front panel and one in the rear) plus two standard auxiliary inputs are included. The Newport has a built-in 25 watts x 4 channel power amplifier as well as front and rear RCA pre-outs -- plus subwoofer output -- to add external amplifiers. It mounts seamlessly into your Pontiac with the included GM mounting hardware and GM wiring harness. Until now, the only solution for your Bonneville has been to install a standard DIN-sized radio -- an installation that looks awkward and out of place. Now you can have the most modern features without sacrificing the looks of your classic Pontiac.